So you got the new home, and now you’re moving! After all the excitement wears down, the reality hits: you’re actually moving. This means packing up everything you own and often entrusting all of your worldly possessions to a moving company. So how do you choose a good, trustworthy moving company? Get online and do a quick Google search and pick the first name that shows up? You might as well put on a blindfold and throw a dart. You should always proceed with caution, because you just don’t know who’s out there & it can be daunting – you’ll see dozens of potential options that may or may not be worth your while. Before you get overwhelmed and decide it’s just easier to do it yourself, take the time to do some additional research. According to the American Moving and Storage Association, the end of the month and summertime are the busiest times for moving companies. You should try to book at least six weeks in advance. October thru April, AMSA says, many companies offer discounts. So, if you’re buying ﻿and or selling your home in the “off season” it can pay off when it comes to moving expenses! You’ll need to decide whether you want to do the packing yourself and only use a moving company for the move itself, or if you want to trust them to do the packing for you. 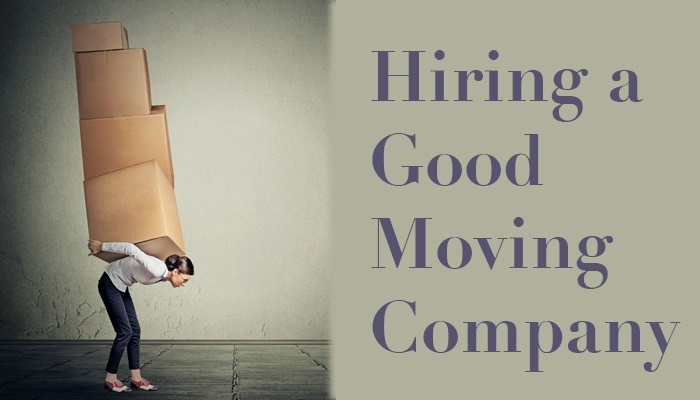 Below is a checklist that will help you interview moving companies to find the best fit for you. First try to get a reference from or a friend who has moved recently. Ask them how the moving experience went. Find out if there was any breakage or missing items. If you can’t get a personal reference, ask your real estate agent, and then be willing to interview companies. Licensing and bonding. The Interstate Commerce Commission offers a pamphlet called “Your Rights and Responsibilities When You Move.” Call your local ICC office for a copy if you’re moving out of state. Local moving costs. These are usually calculated by adding the hours the truck is used multiplied an hourly rate. Long-distance costs. These are calculated on the total weight of your shipment and the distance traveled. Packing. These costs are not included in a basic moving bid. Ask for the price up front to avoid any confusion. If you opt to have the company do the packing, they will inventory your stuff and describe any existing damage. Ask for a copy of the inventory form. Payment. Find out what type of payment the company takes. Using a credit card is recommended if it’s available. Reputation. Check with the Better Business Bureau and your local department of consumer affairs to find out if any complaints have been registered against the company. Storage. These costs are also separate from the moving costs, and loading and unloading from storage is also extra. Have the price spelled out in advance. Written bids. Remember that the bid is just an estimate and plan accordingly. Be sure to get estimates from at least three companies. Get the estimate in writing. Are you certified by the ICC? Do you charge by the pound or by the hour? How much insurance do you carry? Are there any items you charge extra to move? Are you bonded? Can I call to find out the location of my things during the move? Make a checklist of things to do prior to the move. Stay as organized as possible. Talk to your insurance agent about liability. Does your current homeowner’s policy cover your possessions during a move? Moving companies’ basic insurance coverage usually allows a set amount per pound per item, and it’s usually not enough, so find out how much the company carries and then buy extra insurance if necessary. Confirm the arrangements with the moving company a couple of days before your move.